Today’s introduction takes us to sleepy medieval Vacqueyras, town of 100 inhabitants in France’s southern Rhone valley. Nestled in between the towering Dentelles de Montmirail mountains to the east and the expansive Plan de Dieu plateau to its west, the town is often celebrated for its value relative to Chateauneuf du Pape, but rarely for its sheer greatness on its own terms. In considering native son Eric Bouletin and his remarkable story and feeling, I can confidently declare that he is as pure and inspiring a reflection of his land as anyone that I have ever met. 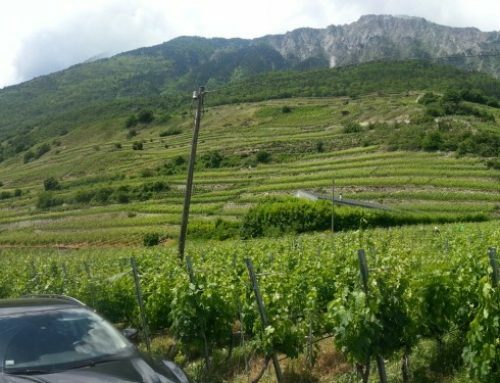 Not only are his wines stand alone stars for his village, I would hasten to say that they are of the most remarkable wines being produced anywhere in the southern Rhone valley. Eric tells me that he has always been considered a somewhat strange bird. He was born the day that man landed on the moon; “moon boy” was a childhood nickname, both because of his birthdate, his gangly frame, and his very active imagination. He is part of a grape growing family that has been settled in the Vacqueyras area for over four hundred years. Ancestors had established a home estate in the 18th century at a place they named Roucas Toumba, Provencale for fallen rocks; Bouletin lives in this same home today. At the age of 15, his father passed away. Less than a year later, he stopped going to school in order to help his mother care for the property. It has almost been 30 years for this 43 year old, 30 harvests that have taught and shaped him. His hands look as though they could tell the story of a 70 year old…. Eric’s heavy manual workload does not preclude more delicate activities; he is also a terribly gifted pen and ink artist. He says that he would always just doodle in his down time, and over time he got really good at it. All of his labels are from his own drawings. 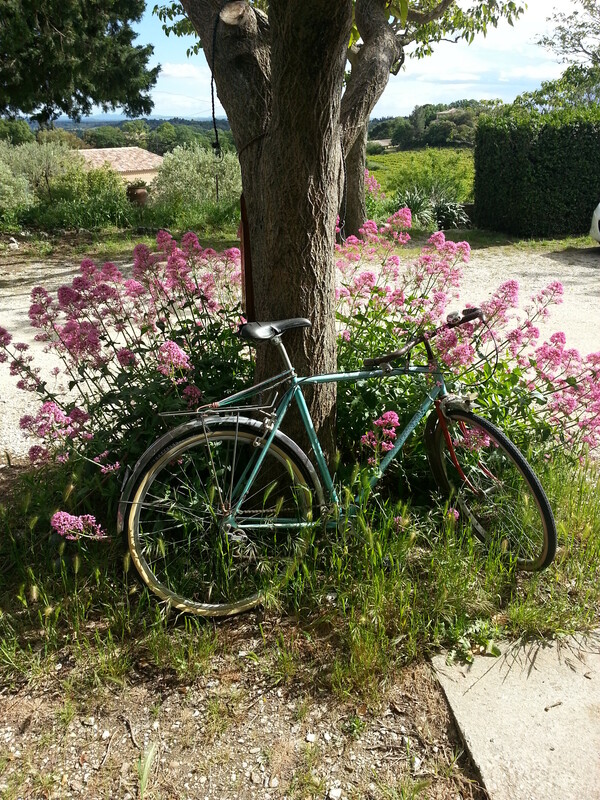 When I visited, I recognized the bicycle that he used to create the Pichot Roucas label. It was leaning on the large tree in front of his house, springtime flowers in full bloom pictured above. I found out later that the bicycle was a gift from his father, for his 12th birthday. He has meticulously cared for it and uses it regularly to this day. During our visit together, we visited the different parcels that he farms. 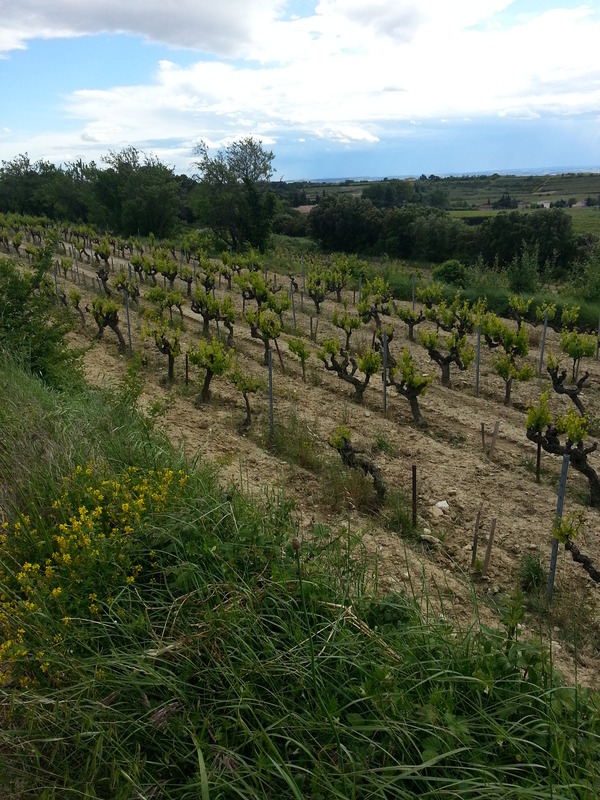 Pictured above is a very special old vine parcel of Grenache called the Restanques de Cabassole. This single terrace of 80-120 year old Grenache has belonged to his family since the mid 18th century. The vines are chest high, like small gnarly trees; the picture doesn’t do justice to scale. Co-planted among fruit and olive trees, they produce 3-4 bunches per plant per year, meager yields of exceptionally good quality. Bouletin said that the grapes he pulled from this vineyard in 2010 were the most beautiful fruit that he has ever seen…….the completed blend is indeed stunningly captivating. Standing on the terrace, taking in the view, it definitely felt like a kind of oasis, a special place to say the very least…..
Eric impressed me deeply as a humble dude who gives every ounce of his life’s passion to his land and the potential beauty of its wines. He struck me as an ever vigilant and devoted gardener, father, poet, artist, comedian, and bittersweet dreamer all at once. You know how sometimes people just leave you with a sense of inspiring humanity, people who simply strike you as being remarkably sensitive and uplifting individuals? Both my wife and I drove away from our brief meeting with that very sense, that Eric is a very special soul. We are not alone in that feeling. Bouletin’s wines are favorites in white tablecloth French gastronomy, savvy bistro culture and beyond. All of his wines, in particular the Restanques bottling, have had nothing but increasingly glowing reviews among the French and American press. Among his peers, if they know of his wines, they universally recognize his special passion and talent. It’s nice to see good things coming to good people….. This too is principally declassified Vacqueyras comprised of equal parts Syrah, Grenache and Carignan. A plump, rich, harmonious rhonie, with silly good quality/price. As good of an everyday bistro Rhone red as one could possibly ask for……. 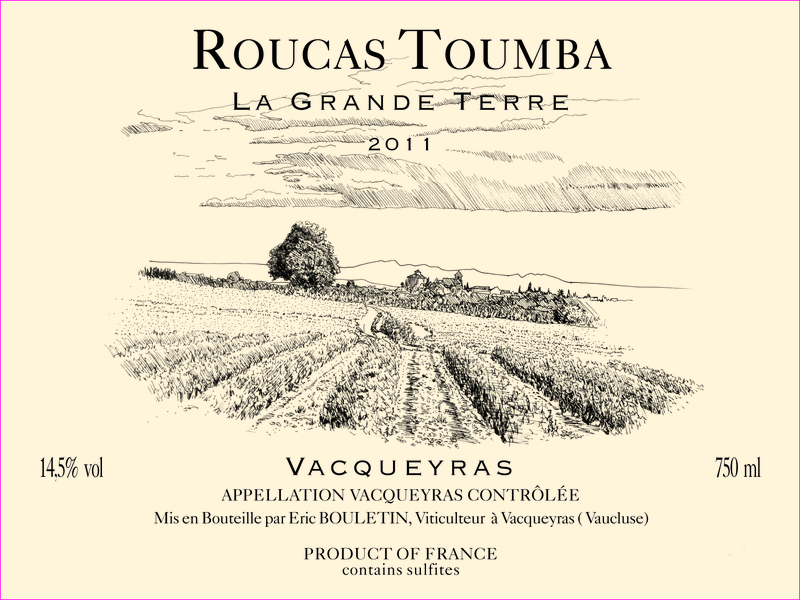 This is the inaugural bottling of what Bouletin considers a more approachable earlier maturing Vacqueyras, his villages to the Restanques’ 1er cru character. A blend of 60% Grenache, 20% Syrah, 20% Mourvedre. It is wonderfully elegant and savory….the varietal purity and friendliness of the ’11 vintage is on full display. For its complexity and harmony, it is a delight. I love to show Eric’s wines; so far, his special something has not been lost on anyone yet……. All wines are in stock. CHEERS TO ERIC, TO ALL THAT YOU ARE!!! 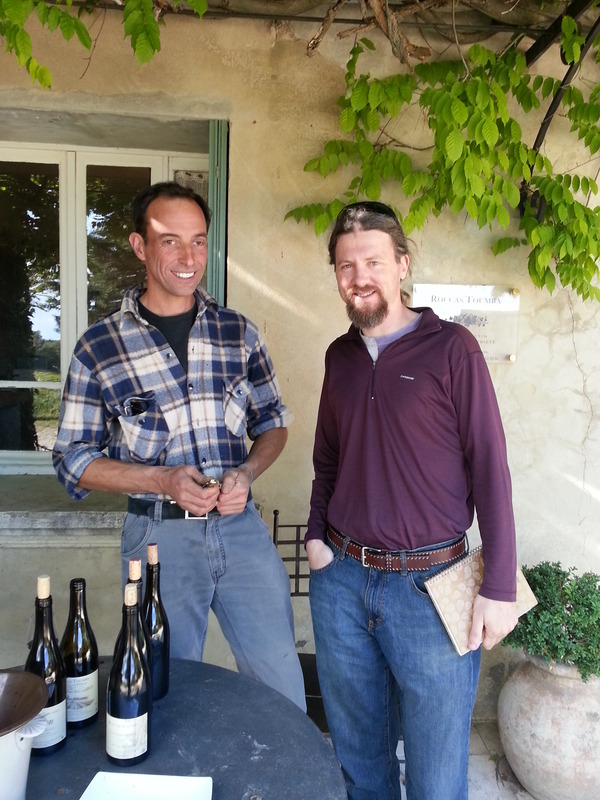 Jean Collet of Chablis: Young Romain is Makin’ Moves! !